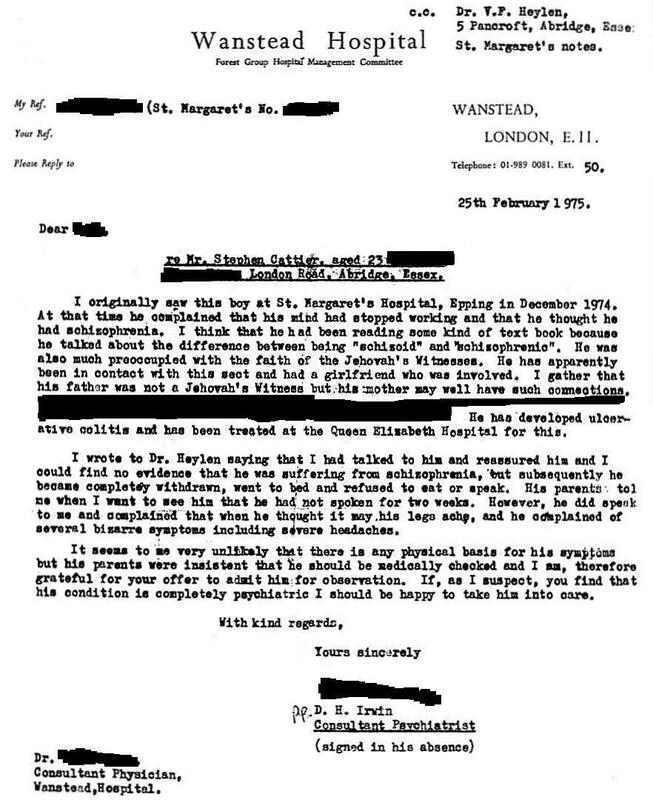 Dr. Irwin, consultant psychiatrist report of Stephen cattier to wanstead Hospiotal physician. I was unable to tell Dr. Irwin the symptoms of the nervous exhaustion when I saw him in Epping in December 1974 otherwise I would have panicked and lost control owing to the the nerve damage to the nerves of my mind. The damaging relapse responsible had been caused either by the first one that was the result of me listening too long to speech or a second one that I cannot recall exactly how it was caused now, but it would have either been from over-speaking or thinking too long. Also, I had actually misidentified my condition as schizophrenia and I believe at that stage not nervous exhaustion. I had read in the second week of December 1974 a couple of paragraphs of R. D. Laing's book The Divided Self which made me draw that conclusion. I was also mentally ill and somewhat psychotic (believing that certain second hand objects of mine were demonised and making me ill, and God had been controlling me) but not overtly so. I do not really remember him visiting me at home post Limbitrol but of course he did, and was able to speak to him because the interest I had in doing it overcame the paralysis for that occasion, and I was gradually improving after Limbitrol damaged me which was two weeks old when he visited. My vocal mechanism felt too stiff to move. My headaches were not normal ones as far as I recall but tightness I suppose I meant when he thought I said conventional headache. I could always crawl to the bathroom but at least at first I had to take a vitamin B capsule to acquire the energy to accomplish it. If I had not been eating it was not through choice but a symptom of the nerve damage. Ulcerative colitis: apart from maybe a slight reoccurrence of it for three weeks in April 1971 I have not suffered from it since 1965 or early 1966. I took an African herb called Fenugreek, a herbal duodenal ulcer tablet, comfrey (can cause liver cancer?) and sometimes slippery elm, plus either prednisone or prednisolone simultaneously with them. With something new to medical science like my condition it is always going to be misdiagnosed if doctors disbelieve it because it sounds too far fetched and, therefore, refuse to specifically look for it as in my case. Ordinary tests have been incapable of detecting it.